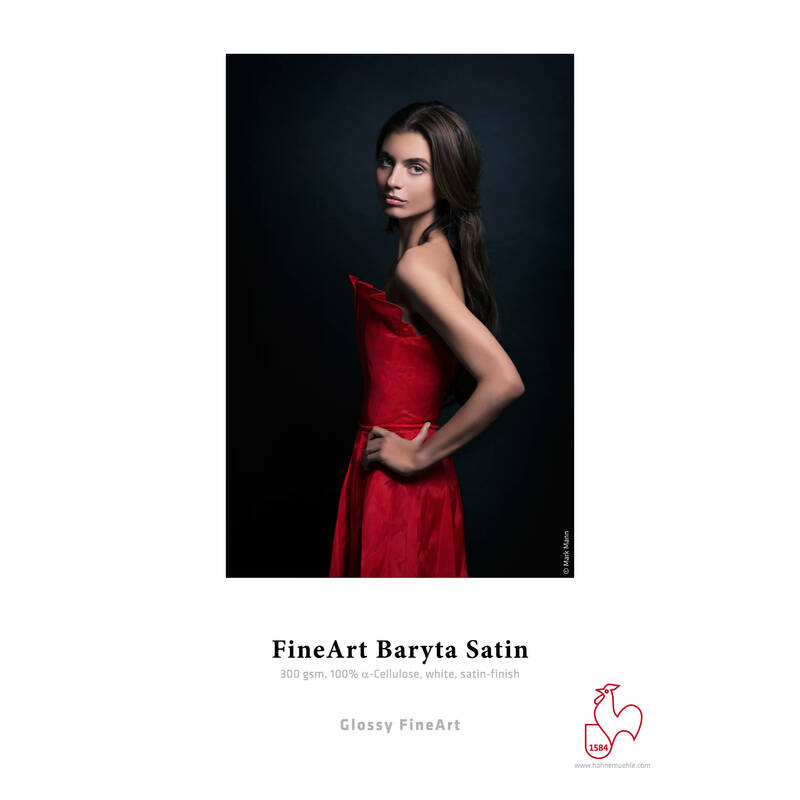 Sheet Size: 17 x 22"
11 x 17" 13 x 19" 17 x 22" 8.5 x 11"
Realize the full potential of your digital darkroom with this 25-sheet pack of 17 x 22" FineArt Baryta Satin Paper from Hahnemuehle. It has a 100% alpha cellulose base with a baryta (barium sulphate) coating that is reminiscent of traditional darkroom papers. This coating also works with the microporous ink-receiving layer for exceptional image sharpness with a wide color gamut and high Dmax. 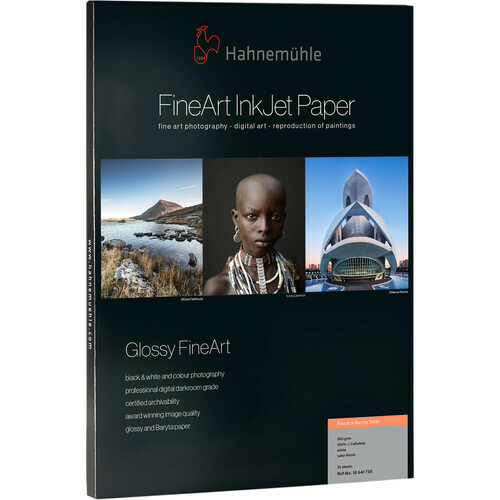 This makes the heavy 300 gsm paper well-suited for black & white imaging as well as color photography and fine art reproduction. The paper itself benefits from the heft of a 14.6 mil thickness, an opacity of 98%, and a whiteness rated at 92%. This white coloration is achieved without the use of optical brightening agents for longevity. The paper is also acid free and calcium carbonate buffered for further longevity and is easy to handle thanks to its instant drying and very high water resistance. Additionally, it has a smooth satin surface finish with a semi-gloss appearance. Box Dimensions (LxWxH) 23.0 x 17.5 x 0.85"
FineArt Baryta Satin Paper (17 x 22", 25 Sheets) is rated 3.0 out of 5 by 1. Rated 3 out of 5 by Thomas Leo from Often inconsistent quality with papers This should be top quality paper with very little variation but I have found digs & scratches, blotches and streaky smears in about 20% of the papers. I thought this was just perhaps one bad batch but have found it with other sizes in the same paper as well as the 17x22 - although the 17x22 is by far the most defective. It also has a tendency to flake off ink on occasion. Wanted to love this paper but its been a hassle.